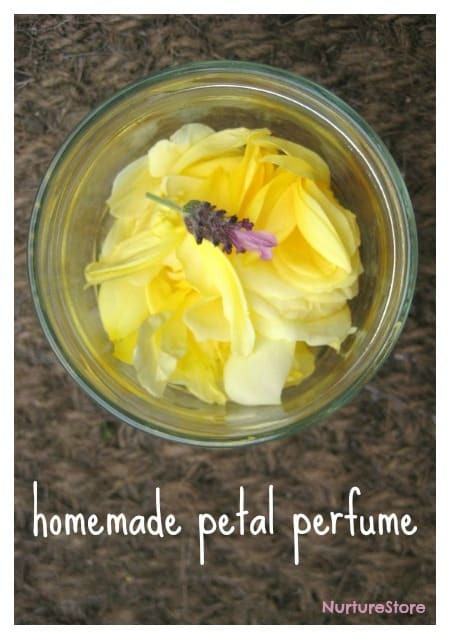 Do you remember making petal perfume when you were a child? 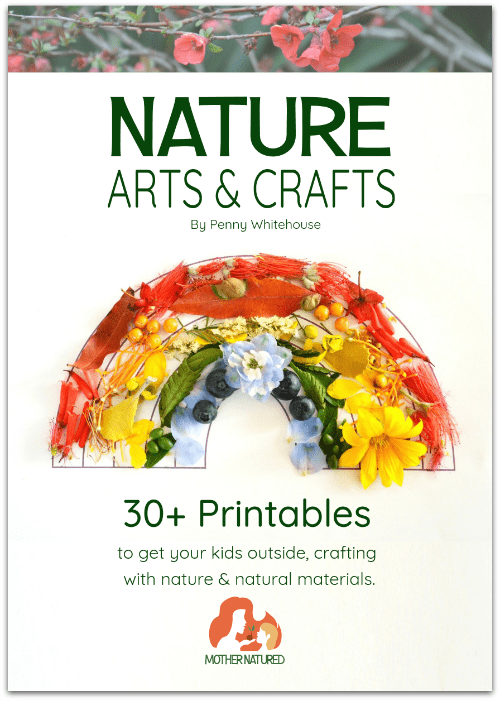 It’s a lovely garden sensory play idea I’m keen to pass on to my daughter. Both my girls have their own special plant in our garden, one they’ve chosen, planted and look after. My 7-year-old is a natural romantic, so hers had to be a rose. 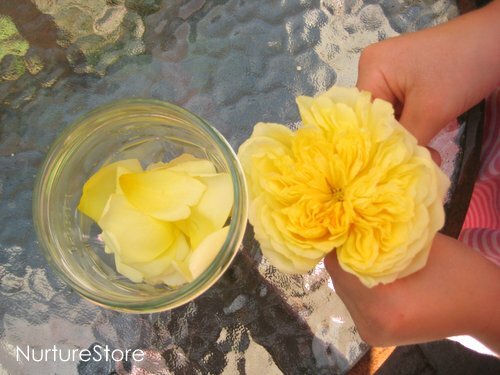 She chose a yellow one called Pilgrim, which flowers in her birthday month of June. 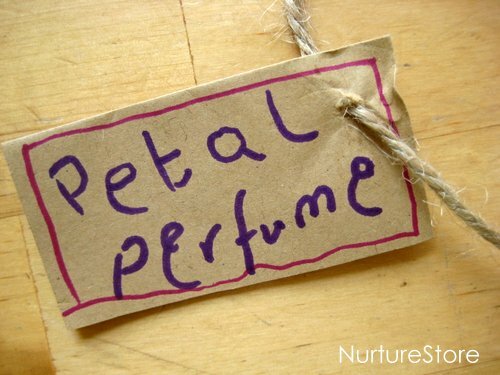 It has a beautiful, delicate scent which reminds me of sherbet – just right for make petal perfume. I sent her off round the garden on a scent hunt to see what else she could find that smelt good and she decided to add some lavender to her perfume too. We poured on some just-boiled water and left the petals to steep, like we were making fragrant fairy tea. We left if for a few hours and the water took on the scent. We strained off the water to keep as our perfume, and discarded the petals onto the compost heap. My girl’s not especially fond of writing but give it a practical purpose, especially one that she’s very interested in, and we can gently include some reading and writing practice in most things we do. 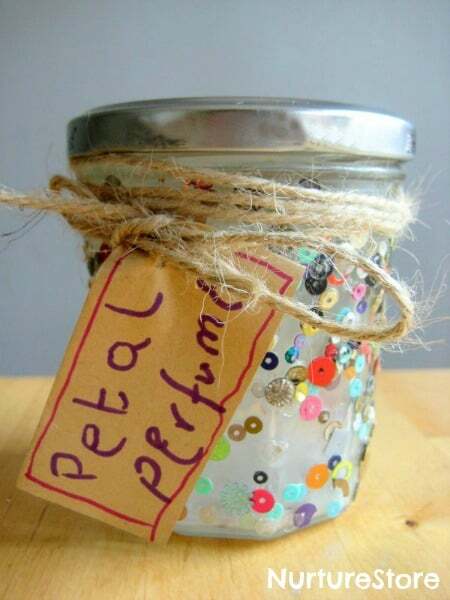 For our perfume pot we used a sequined jar (you can see how we made this jam jar candle holder here). My daughter likes to drab some on her cheeks, or gently sprinkle a few drops on her pillow, to encourage fairy dreams! 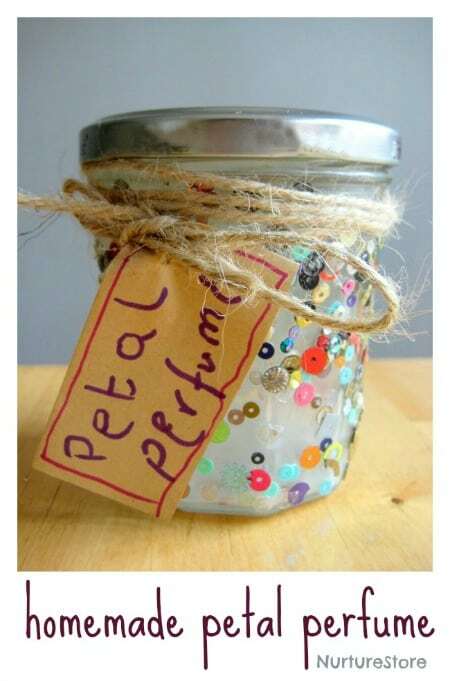 What a fun idea – I love that you incorporated both crafting a pretty jar and writing into this activity. I am in love with this! What a beautiful activity and what a bonus that you were able to incorporate some writing practice as well. Thank you Ann. I’m wondering if she will ever *love* to write – but at the moment we like sneak some practice in. I love this, thanks for sharing! My toddler loves making lotions & potions but I’ve only just begun to wonder if I should try to a ‘manly’ smell for him. Any thoughts? Hi Amanda. 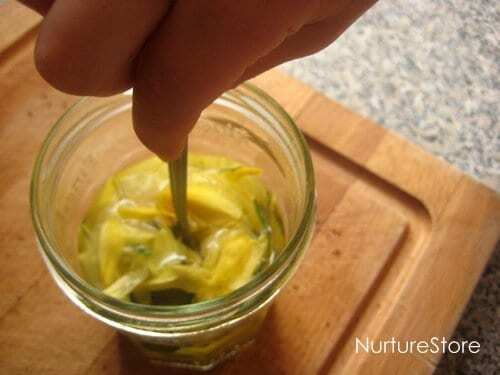 What about using some rosemary? What about calendula and spearmint? Yes, they would be lovely. The calendula in our garden is just about to flower, so we’ll have to try some.